Painting a house, either on paper or in person atop a tall ladder, has a hidden danger most are unaware of. 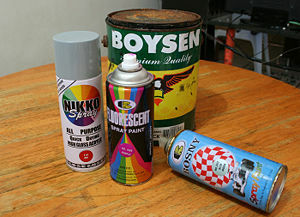 Paint can be toxic. Toxic to humans, toxic to the environment and definitely not something you want contaminating the waterways. The toxins are in the binders as well as the pigments themselves. Acrylic paints contain fewer solvents, and less of them than oil based paints and are therefore relatively safer. Protecting the latex in the paint may call for arsenic disulphide, phenol and copper. This problem toxicity is very true of mass produced house paints, a real warning to those artists who paint with test pots. Paint on the hands, or in the mouth via the end of the paintbrush, is not a good thing. Many metal pigments used in paints, for example the heavy metal cadmium which is common in yellow, orange and red pigmentsa re highly toxic and also quite rare resources. These pigments could be avoided by your choice of paints, or you can look for paints that have been manufactured in accordance with strict environmental laws. The manufacturer of the paint should be listed on the tube or tub. If it has been made in the UK, Europe or USA or Australia, chances are the laws governing its manufacture are tighter than those of China or India. Paints manufactured in the UK or Europe are subject to tighter laws than those made in the USA. Paints made in Australia and New Zealand will have had less travel kilometers clocked against them. For artists wanting to prime canvases, or those seeking an environmental advantage, there is Enviropaints, www.enviropaints.co.nz , a Wellington based company making paint from recycled paints. Of most importance when painting, is the safe washing of brushes and rollers afterwards. Make an environmentally friendly choice when cleaning up after painting. At the end of the job wipe or squeeze excess paint onto an absorbent material such as old rags, shredded newspapers or cardboard boxes. Allow to dry and dispose of with household waste. Wash brushes, rollers and other equipment with water in a 20 litre or similar sized container. The most effective method is to use a roller spinner. Transfer the washed equipment to a second container filled with clean water for a final rinse. Place lids on the containers or cover in some other secure manner and allow to stand overnight. By morning, the paint solids in the first container will have settled down to the bottom of the container. The clear water from this container may now be poured onto the garden or any grassed or open area away from streams, rivers or lakes, where it can be absorbed into the ground. Disposing of the paint solids at the bottom of the first container: Scrape the paint solids out onto absorbent material such as old rags, shredded newspapers or cardboard boxes. Allow to dry, then place in a plastic bag and dispose of with the household rubbish, or take it directly to the nearest council tip. The second container now can be used as the first wash. Use this rotation system until the job is completed. In the case of solvent based paints, use rags and newspaper to clean the brushes first, then use solvents to wash equipment. Allow the first container to stand at least 24 hours as it will take this long for the paint solids to settle. Do not pour the clear solvent onto the ground - use it to top up the second container or decant and keep for future use. Use as little solvent as possible. Caution: Never allow waste-water or chemical solvents from washed paint equipment to enter household or storm water drains or sewers. The waste may find its way into natural waterways where it can reduce oxygen levels and threaten the survival of fish and other aquatic organisms. It's a good idea to keep a container of dirty turpentine on hand for cleaning purposes. You will be able to reuse the solvent time and time again. Don’t shake it, and keep it in a safe place.